The shy kids, the anxious kids, the kids that have knots in their stomach because they don't know the teachers, the building, the other kids. The kids who aren't sure how they are going to remember which locker is theirs, where their locker is going to be, how long will it take to memorize their locker combination with all the other new things going on. The kids who wonder who they will sit with at lunch, who they will meet, laugh with, talk to, or will they just be alone unable to eat anyway with all these "new kid" anxieties. The kids who wonder if they should try out for cheerleading, drama, football, basketball. The kids who want to make the move to 'fit in' but aren't sure how. The kids who really just want to be part of a group, a few friends to call their own. "God is our refuge and strength,an ever-present help in trouble." "Ask, and it will be given to you seek, and you will find; knock, and it will be opened to you." "Let the beloved of the LORD rest secure in him, for He shields him all day long, and the one the LORD loves rests between His shoulders." 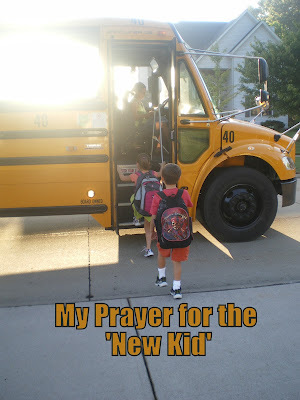 Now as an adult stretching into my late 30s, I look back at this time of year for myself as 'the new kid' so many times. I was the Air Force Brat that moved every 18 months. I still remember the waves of ﻿anxiety and fear and apprehension; the feelings of helplessness and insecurity. Know that I am showering you all, all new families, especially the new kids this time of year, in prayer. This is not an easy time. But God is in control and you can lay your fears down at His feet and know that He is listening. If you aren't the 'new family' on the block make it a point to introduce your children to the 'newbies'. Be the kind face they need, the new friend that will say "I'll see you at the bus stop!" or "I'll find you at lunch time!" or "I'm trying out for the school-play will you do it with me?" Be Christ like and you will find unfathomable joy in your heart. Leanne, at 29 ... 30 ... ok maybe 38 is an Air Force Brat. A title she wears with pride. It has shaped her into the Army Wife she is today. She is the mother of four boys. The cleaner of dirty knees and noses. The washer of filthy clothes and floors. But most of all she is the words of encouragement whispered in her boys' ears when they need it most.